“First Four” or “Play In Games” are resented by many HBCU fans, but there is real opportunity for many MEAC and SWAC squads. North Carolina Central is back in the NCAA Tournament for the third straight season, and back in Dayton, OH for the third year in a row as well. His statement went much deeper than tinkering with the format, it also addressed the difficulty teams like his have in scheduling, but many in the HBCU world have expressed frustration with being “forced” to play in the First Four or “play-in” game. While monumental upsets like Coppin State over South Carolina or Hampton over Iowa State or Norfolk State over Missouri are legendary moments, they are few and far between. The fact is, most years HBCUs are better off in the First Four. Why? Because these games, more than the traditional 1 vs. 16 provide HBCUs with an opportunity to gain the two things that keep most of them treading water in Division I: money and exposure. Sure, playing with the rest of the the programs on Thursday or Friday has its benefits. Mainly, it gives players a few more days rest after tournament runs that could require as many as four games in six days. But the drawback of being caught in that flury of games is viewers have so many choices, its easier to be overlooked. The benefit of playing on Tuesday or Wednesday is that your players are in the groove of playing and the eyes of the college basketball world are upon you. Besides the eyeballs, the First Four provides HBCUs a better chance to bring home more money. An appearance in the NCAA Tournament is worth about $1.67 million for a conference, broken down over a period of six years, according to the Washington Post. Each round produces a “unit” for the conference, which splits the money between schools. Simply put, the more games you win, the more money your conference pulls in. The First Four simply allows HBCUs a chance to match up against more evenly talented, financially supported institutions for a shot at getting to the next round and getting more money. Those three 15-2 wins are great, but those three wins came over a period of 15 years, from 1997 to 2012, or one every five years. HBCUs have won three First Four games since 2013, which translates to one ever two years. You don’t have to be a statistician to know which path will make HBCUs more money over the long run. There will be some years where teams from the MEAC and SWAC have a legit shot at pulling off an upset and have a regular season worth consideration for a higher seed. The 2014 North Carolina Central team went 28-6, including a program signature win over nearby ACC team North Carolina State. It finished the deal by winning the MEAC Tournament and was given a no. 14 seed for its first-ever NCAA Division I Tournament appearance. It lost to Iowa State. 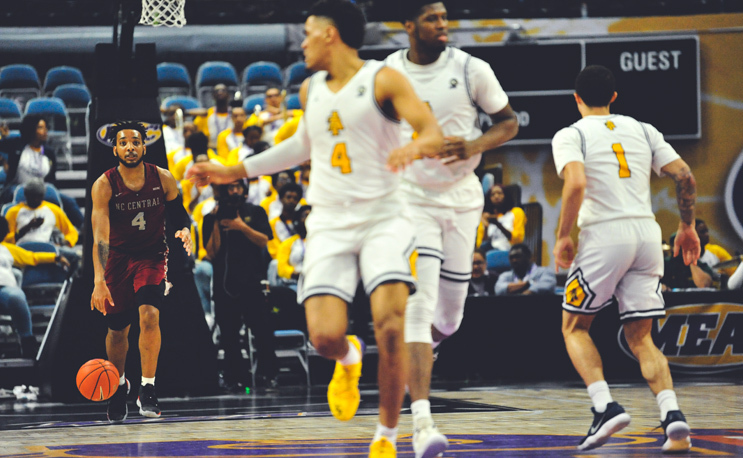 Sandwiched between NCCU’s dream season were two MEAC champs in North Carolina A&T (2013) and Hampton (2015) who were middle-of-the-road teams who were afterthoughts before pulling off upsets in the conference tournament. (NCCU went 25-8 in 2015, but lost in the semifinals to Delaware State.) Both of those teams were rightfully sent to the First Four, and both came out with wins and more publicity than if they were slotted as traditional no. 16 seeds taking on no. 1s. All HBCU fans dream of a day when an NCCU or a Texas Southern can get on a VCU or George Mason-like run that will bring notoriety and respect, along with more exposure and awareness. But much like the FCS football playoffs, funding for a national championship at the Division I level just isn’t there. Think of it as the basketball version of the Celebration Bowl, which many HBCU supporters absolutely love for the money and exposure it gives. The formula for staying out of the First Four is simple: Don’t lose double-figure games overall, win your conference regular season and tournament. Do that and get stuck in the First Four, then we’ve got a problem. Otherwise, get the first win and keep that momentum against the no. 1 seed and as we learned last year, anything can happen. Very unpopular opinion. Most people don’t even recognize the play-in games. Tournament challenges don’t even count them. They are a joke. HBCUs need to schedule better and wins games against decent competition to become relevant. No 5 star recruit is going to an HBCU because they won a play-in game. I would love to see all the MEAC teams go back to D2 but I know that will not happen.